Don’t call it a comeback. After years of dominating the field of animated films, Pixar has been showing signs of weakness since 2010’s “Toy Story 3.” At the same time, other animated filmmakers have shown serious improvements with films like “How to Train Your Dragon” and “The Lego Movie.” With Pixar’s newest release, the company is hoping to solidify their reign at the top before companies like DreamWorks can take over. “Inside Out” is a daring idea in that the film takes place almost entirely inside the mind of an 11-year-old girl named Riley. Though briefly interrupted here and there with a real-life plot, the main storyline follows Riley’s emotions Joy (Amy Poehler), Sadness (Phyllis Smith), Fear (Bill Hader), Disgust (Mindy Kaling), and Anger (Lewis Black). When her parents move the family from Minnesota to San Francisco, Riley (and her emotions) have a tough time adjusting to the new lifestyle. When chaos ensues inside the control room where Riley’s emotions live, it’s up to Joy and Sadness to save the day before Riley loses what makes her Riley. Probably the two biggest attributes that have followed Pixar films throughout the years are great animation and heartfelt characters. The former is certainly on display with “Inside Out.” Everything about this film is aesthetically beautiful. Whether it’s the imaginative world inside Riley’s head or the scenes on the streets of San Francisco, the animation is some of the best work the medium has ever seen. 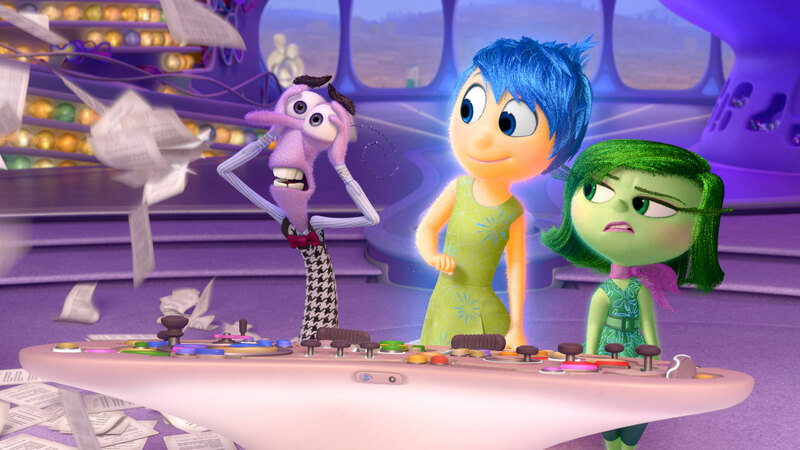 As for the latter, “Inside Out” may be the most emotional film Pixar has put out to date. Of course in a film where the majority of the characters are actual emotions, that shouldn’t be too much of a surprise. The only problem with this setup is that most of the characters are also very one-dimensional. There’s not a lot of growth opportunity for a character named Anger who’s voiced by Lewis Black. Fortunately for the film there are other characters inside Riley’s head who give the film a little more heart, namely her childhood imaginary friend Bing Bong (wonderfully voiced by Richard Kind). Humor is another important part of any Pixar film and there’s plenty to go around in “Inside Out.” Not every joke is a rousing success but there are several funny sequences and ideas tossed around in the film that you may not catch on the first watch. It may not be as entertaining as some of Pixar’s better films, but “Inside Out” is an important film for kids and adults because it teaches audiences about the process of growing up. While that isn’t necessarily a new concept for film or children’s stories, the way in which Pixar is able to approach the subject makes it very unique. If nothing else, “Inside Out” proves that Pixar still has the juice to make thought-provoking films for the whole family and that the company’s legacy is in good hands. There is a limited number of films in existence capable of captivating an entire audience and imprinting the moment on each person’s psyche. Movies like “Indiana Jones,” “Star Wars,” “Back to the Future,” and, of course, “Jurassic Park” come to mind. So when a new installment of these franchises is announced, there are two competing thoughts that race into one’s head: 1) This is amazing news! and 2) They are definitely going to ruin a film that I love. In the case of “Jurassic World,” the filmmakers decided it best to go with a popular note among studio executives: make it the same, but different. Instead of bringing back Sam Neil and his trademark hat and neck scarf, director Colin Trevorrow (“Safety Not Guaranteed”) and writing team Rick Jaffa and Amanda Silver basically rehash the original film’s premise, this time with a park that has been successfully running for 2 decades rather than a small dress rehearsal with scientists. With the incident from the 1993 film in the past, Jurassic World has opened to major success with innovation and popularity that John Hammond could have only dreamed possible. It’s amazing to look back on the original park and see just how much the technology has changed in 22 years. Instead of Jeep Wranglers driving on designated tracks, the park is now equipped with a monorail and has a ride where you can drive alongside herds of dinosaurs inside of a protected sphere. But enough about how cool the park would be to visit, let’s get back to the story. Serving as the director of the park, Claire (Bryce Dallas Howard) is desperate to find a new attraction that will help the park maintain its booming business. As she says in the film, people are no longer excited by the idea of merely bringing dinosaurs back to life (an interesting moment of self-observation for the series). It falls to Dr. Henry Wu (BD Wong) and his team to create a new dinosaur with more teeth that is a hybrid of several species. Enter the Indominus Rex, a 50-ft killer with a long list of spoilerific upgrades not to be shared in this review. 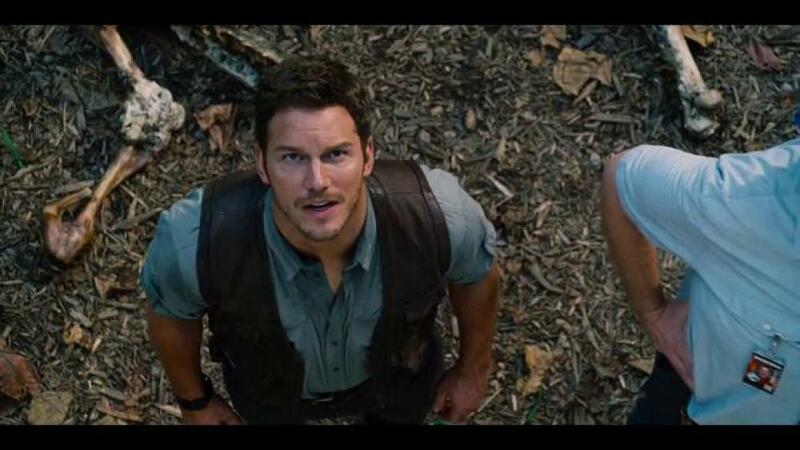 The other characters of note in the film are the male protagonist Owen (Chris Pratt), a Navy vet who is responsible for training the velociraptors and two brothers (Ty Simpkins and Nick Robinson) who are visiting the park for the first time to see their aunt Claire, who runs the place. There are often many moral and philosophical questions pondered in the Jurassic Park films, as well as Michael Crichton’s books. In the original, Ian Malcolm (Jeff Goldblum) was the voice of reason who states “your scientists were so preoccupied with whether or not they could (create dinosaurs) that they didn’t stop to ask if they should.” This time around a similar conversation takes place between Dr. Wu and the new owner of the park, Simon Masrani (Irrfan Khan), where the film discusses the implications and dangers of creating new monsters. While covering many of the same topics touched on previous films helps the new one find its place in the series, what matters for “Jurassic World” is whether or not it holds its own as a summer blockbuster. In this regard, it’s a success. Let’s not confuse success with being perfect, though. Many of the characterizations, including Claire and Owen’s dynamic together, are very archaic. There are a few ideas in the film that are a reach (Yes, even for a movie about dinosaurs) and not all of them pay off. Without spoiling too much, one character thinks it’s plausible to turn raptors into drones for the military. Spend more than five seconds thinking about that plan and see how good it still sounds. Probably the biggest complaint that will be filed against “Jurassic World” is that it isn’t as good as Spielberg’s original film. Is that fair? No. Is it true? Yes. Like many Indiana Jones fans would probably say: maybe an exciting new installment of your favorite franchise doesn’t have to be perfect. It just can’t be about aliens or feature Shia LaBeouf. On that note, “Jurassic World” is a clear winner. Though it has a few stumbling moments here and there, “Jurassic World” is a worthy successor of the franchise. After he fails to impress the judges of the World’s Fair with his homemade jetpack, young Frank Walker (Thomas Robinson) is befriended by a girl named Athena (Raffey Cassidy) who gives him a strange pin that leads him to a mysterious futuristic world with robots and other contraptions he could only dream of inventing. Decades later, Casey (Britt Robertson), the daughter of a NASA engineer (Tim McGraw), struggles to find her place in a world that seems determined to brace for the apocalypse rather than trying to prevent it. 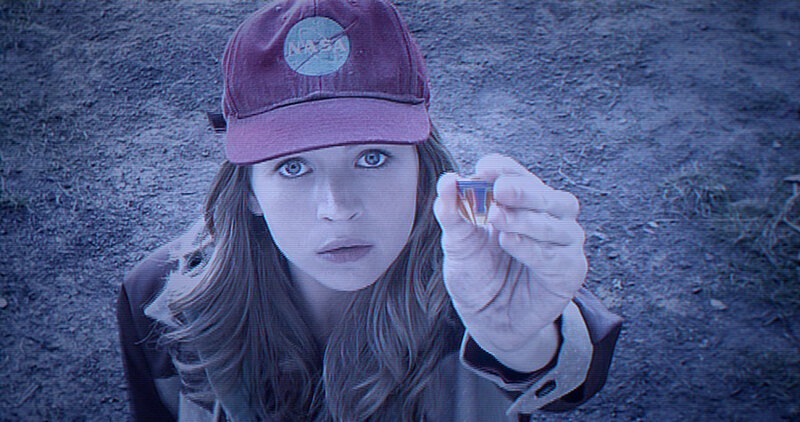 After being arrested for trespassing on government property, Casey discovers a Tomorrowland pin of her own when she reclaims her belongings in the police station. Upon touching it, she receives visions of a fantastic world of imagination and sets out to find more information on the strange land. This eventually leads her to an old Frank Walker (George Clooney) who has been excommunicated from Tomorrowland and is every bit as cynical as Casey is optimistic. If that seems like a really long buildup for a plot, you should try spending 45 minutes in a theater waiting for the pieces to connect. “Tomorrowland” is the latest attempt by Disney to monetize every aspect of their existing properties. Much like “Pirates of the Caribbean” and “The Haunted Mansion,” this film is intended to expand the Disney empire while also (hopefully) putting together an interesting film. Dialing down the cynicism for a moment, “Tomorrowland” has some very interesting things to say about the world we live in today. We are a culture engrossed in chaos and violence on the news and dystopian futures in our entertainment (“The Walking Dead” and “The Hunger Games” come to mind). Every day there is a new story to outrage over, a new product or company to blacklist, new laws or guidelines enacted that stomp out creativity or free speech and so on. As great as these ideas are, director Brad Bird and writer Damon Lindelof still have to mold them into a cohesive plot that is entertaining and makes for a good film. That’s where the trouble starts. It is well known around the film community that Lindelof has a reputation as a writer that dreams up big ideas that he can’t necessarily deliver on. The two best examples of this are the TV show “Lost” and “Prometheus.” While not all of Tomorrowland’s faults can be placed on Lindelof (Bird also handled the script), it’s important to point out the pattern. The biggest issue with the film, aside from the writing, is pacing/editing. As previously stated, it takes 45 minutes for the film to address what the story is about. Until that point, the story is mainly several scenes of Casey tripping over objects while “walking” through Tomorrowland or Athena telling Casey that she’s important in the most cryptic way possible. After all the time the movie spends setting up the plot, the payoff is extremely underwhelming. Tomorrowland itself looks like a leftover “Divergent” set and the villain (Hugh Laurie) who has been set up to be a very bad guy (his robot army kills several people early on) ends up being a pretty reasonable character who has the best monologue in the film. Not to mention that the “chosen one” is barely of use in the climax. “Tomorrowland” is what happens when a creative team comes up with about 60% of a full story, realizes it can’t finish it in the remaining time, and hopes the audience won’t notice the corners that were cut. There are pieces of a great family adventure film scattered throughout “Tomorrowland,” but the final product looks more like a first draft than a film Disney would bank $190 million on. Not even the Tim Allen-esque performance of Clooney will help the film earn back its big budget. All in all, “Tomorrowland” is a missed opportunity that may be best enjoyed on Redbox or when it inevitably pops up on ABC Family.